After coming back from Thailand, I got to slow down a little on having big meals. Sometimes is hard to do as I just love food too much. Sometimes it is almost cruel to think that indulging in good food can lead to sickness and obesity. Why all the tasteless foods are the ones that can make us healthy. After taking a few days break, I decided enough is enough. I will go to my favorite banana leaf restaurant in Little India. Been patronizing this restaurant for many years now. 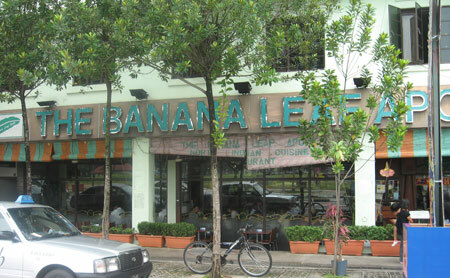 Some of you might not be familiar with the term “banana leaf restaurant”. Is basically an Indian restaurant serving you food on real banana leaf. North Indian and Indian Moslem restaurants do not cut it as banana leaf restaurant. 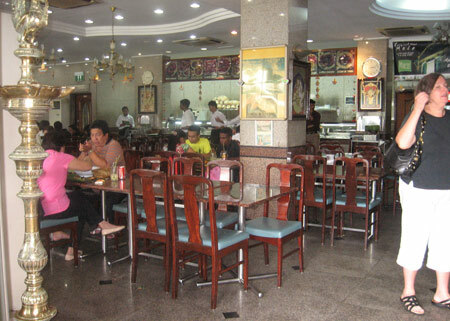 The Indian Moslem restaurant are commonly known as Mamak restaurant here in Singapore and Malaysia. So it is quite safe to say that banana leaf restaurants are mostly Southern Indian cuisine. I guess the desire for me to visit Banana Leaf Apolo Curry House on that was my mouth lacked the presence of spices. My body need to get spiced up to function normally. Also maybe I just wanted some Indian food due to the Deepavali fever. Arrived at 2.30 pm to avoid the crazy packed lunch hour crowd. There were still quite a few customers as most of the lunch crowd have gone back to their offices with a full stomach. I already knew what I wanted before even stepping out from my house. But I still love to go over to the food counter to look at those delicious Southern Indian dishes. 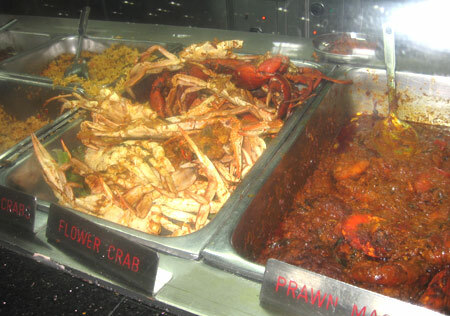 Seen here are some flower crab curry and the tasty prawn masala. I wish I was there with a big group as we can order ADT. ( Any Damn Thing ). Some more dishes by Banana Leaf Apolo. Mutton masala and some other dishes. This restaurant is famous for its Fish Head Curry. 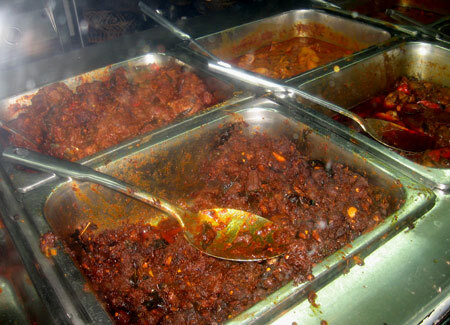 It is not displayed in the food counter as it specially prepared in the kitchen. 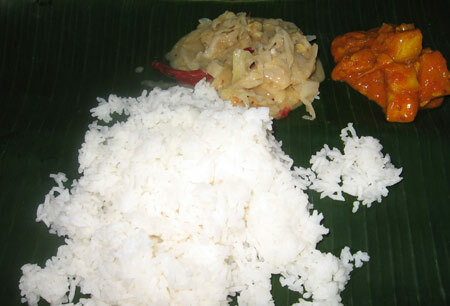 First came the banana leaf, then followed by plain rice. Then followed by the vegetables. You don’t need to select the vegetables as it only has 2 choices. 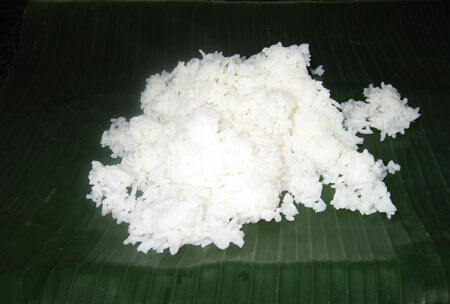 Typically in a banana leaf restaurant, you can add as much rice and vegetables as you wish by paying it only once. The curry gravy and papadam are also free. In Apolo, it cost SGD3.50. So is actually a good deal if you can eat a lot. 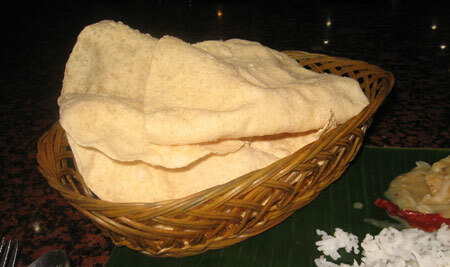 Generous serving of papadam ( Indian spiced chips ). Taste really good with rice and curry. Add as much as you wish. This was what I wanted when I decided to visit Banana Leaf Apolo. 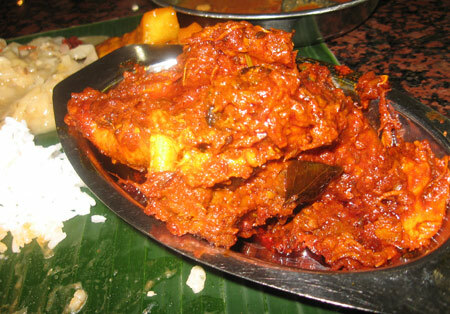 The spicy and super delicious chicken masala. It cost SGD4.50. This is rassam. I not sure if it rassam qualify as a soup. Normally soup is a dish where it can be eaten by itself. I seldom see people just consume rassam all by itself. Rassam is good to eat when you pour it all over your rice and curry. 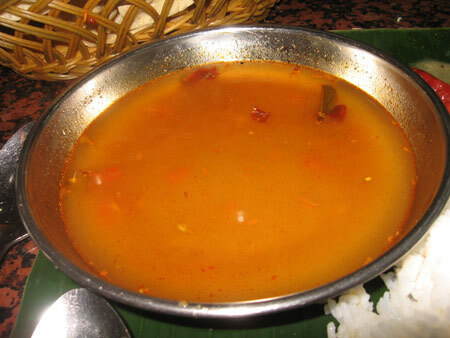 Taste of rassam is sourish ( I think is tamarind ) mixed with aromatic Indian spices. My Indian friend told me that rassam can cure sinus. I’m not sure if it is FDA approved and I don’t care. It just taste so good. After sucking all the gravy from my chicken masala ( now chicken bones ) and finished meal, I need to sit down for a few minutes to let my stomach settle down. When it is time to pay, you need to go to the counter. My meal cost me SGD10.70. Is quite pricey for Asian standard but hey, Singapore is a first world country. 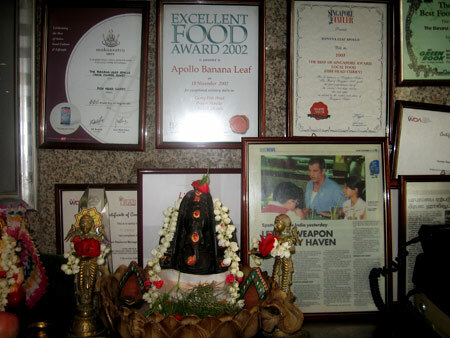 While waiting for my change, I just took more pictures of awards given to Banana Leaf Apolo. I saw the picture of Mel Gibson being displayed. I think I’ve mentioned in some of my older post about restaurants using celebritiy pictures to “impress” customers. I for one are not those who will be impressed. What makes all these celebs knows more good food than I do? If I were to own a restaurant one day, I will put pictures of older women or housewives customers. These are actually the kind of customers that we should trust as they are very picky when it comes to eating out and they been cooking for years. I bet if I were to hang all these random housewives pictures, the restaurant would probably have a lot of curious customers staring at the wall and trying to figure out who the heck are these “famous” women. Can’t beat Sammy’s for the chicken and big prawn masalas nor the fish curry. Problem is Sammy’s accessible only with car whereas BLA easily accessible by mrt or bus.